In the Page Settings panel you can specify the way you want the pages to be turned. You can set the Standard Page Turn and Page Timers in this panel. You can scroll between the pages by using the arrows to the left(previous) or the right(next). The Page Crop, Half Page and Half Turn options show a preview of how the page-turns will look like. The Page Crop function helps you maximize the size of the pages by cutting off unneeded margins of the pages. The Standard Page Turn defines wether the page will turn per half page of by a full page. Please note that this only works in the Standard Turn From File mode. By using the slider to the right you can specify where the page will turn when turning by an half. 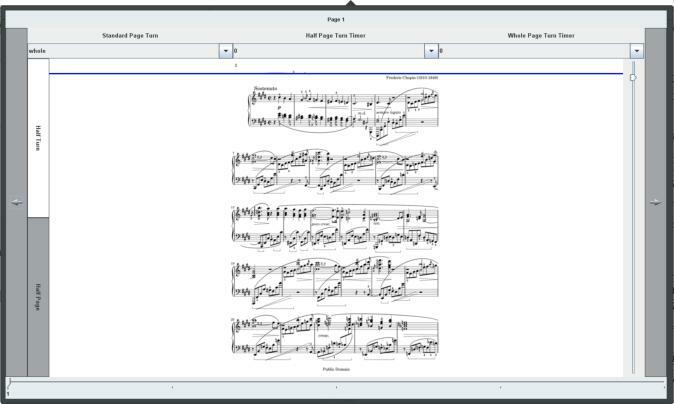 The Page Timer setting can be used for the Turn by Timer option, this is currently only featured in the iPad version. With this timer you can set the timer for a full page, as well as a half page. Posted by: Nick Leoné - Sun, Feb 20, 2011 at 4:43 PM This article has been viewed 4712 times.